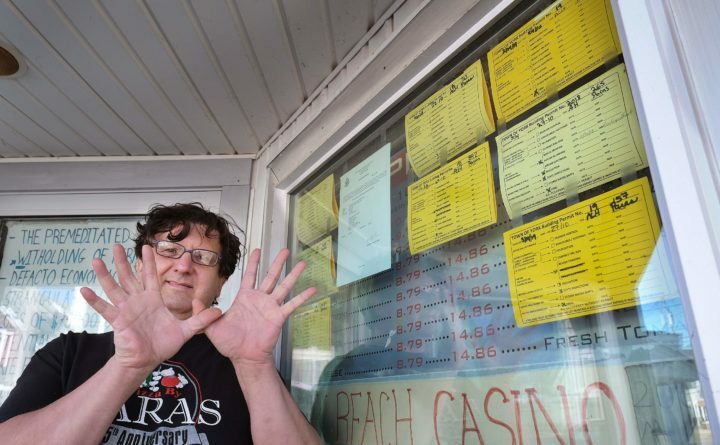 Spiro Paras stands outside his family's Railroad Avenue building, where the windows are covered in various permits. The family pizzeria has been shuttered for years as Paras and the town of York have been embroiled in permitting disputes. Now, town officials say they're optimistic the building can be permitted to be reopened, but Paras says he's skeptical. YORK, Maine — Code Enforcement Officer Amber Harrison said she believes “things are moving forward” between the town and the Pizza by Paras building owners in York Beach. But Spiro Paras said after 10 years of legal and permitting wrangling with the town, he is not feeling particularly optimistic. Paras, the son and representative for building owners Eleni and Ernest Paras, two weeks ago secured a permit from the state fire marshal’s office. Harrison has long indicated that was a necessary first step toward securing the town building permits needed to begin serious renovation work at the Railroad Avenue property. “I’m more optimistic than ever. We’re closer to seeing a building that meets life safety codes,” said Harrison. Paras said he plans to work in phases. The first phase would be to open a pizzeria with entrances on Bay Street and on the sides of the building, and expand later to the Railroad Avenue storefront portion of the building. He has hired Lindsey Architects of York to draw up plans. He has already secured a number of permits from the town for what Harrison has termed minor work, such as repairing a portion of the roof, building a fire wall between the dining and kitchen sections and putting up an awning. “If the town of York truly wants the Paras family to reopen a restaurant at its location of 50 years, we will in no way be the ones to impede this from happening,” Paras said in a prepared statement. But he said he has become distrustful and mindful of the fact that still pending is an “80K complaint” filed by the town in York District Court against his parents and him in 2017. These complaints are filed when a municipality has been unsuccessful in land-use violation negotiations. Harrison said the judge in this case made clear to both parties that he wants to see a mutual resolution to the complaint. She said since Paras hired former Code Enforcement Officer Tim DeCoteau, “the communication is a lot better” than in the past. She said she’s hopeful by the time of the trial date set by the court at the end of May, the town and Paras family can come to agreement. Under terms being discussed, she said, the town would issue one permit for all the work as long as it’s completed in three years and Paras lets the town conduct site visits. But Paras is clear he doesn’t believe the town will live up to its promise. “My experience after nearly a decade of complying with the town’s innumerable requests — engineering plans, architectural plans, twice, endless inspections etc., etc. — is that like the Labors of Hercules, the intention is for them to never finish but to finish off the doer,” he stated. He remains convinced, as he has said in the past, that York “has zero interest in resolving the issues” with the building.